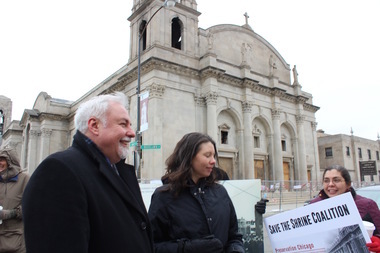 Ward Miller, left, of Preservation Chicago announced that donors have pledged $450,000 towards restoring the burned Shrine of Christ the King, which the Archdiocese wanted to demolish. CHICAGO — After being threatened with closure due to a fire last October, the Shrine of Christ the King will be restored, the Archdiocese of Chicago announced Sunday. The building and land at 6401 S. Woodlawn Ave., have been deeded to the Institute of Christ the King Sovereign Priest, and the group has enough money to restore the building, according to the archdiocese. The Shrine of Christ the King was ravaged by fire in early October after oil rags spontaneously combusted. The archdiocese filed for permits to tear down the shrine, but fundraisers were able to gather enough donations to "stabilize" it and pay for restorations. “We express our deep gratitude to all the individuals and organizations whose most generous and timely donations helped bring us to this moment. We are mindful of the dangerous condition of the shrine and will begin stabilization immediately with funds already collected,” said the Rev. Matthew Talarico, the shrine's canon, according to the archdiocese. Firefighters were able to rescue a 300-year-old statue Christ the Child from a fire at Shrine of Christ the King in October 2015. The coalition "raised more than $650,000 in pledges made to Preservation Chicago and collected more than 2,000 signatures on a petition to save the shrine," according to a Sunday news release. The shrine will host a festive Mass 10 a.m. March 19 in the gym of First Presbyterian Church, 6400 S. Kimbark Ave. Designed and built in 1923 by Henry J. Schlacks, who was inspired by Italian architecture, the church was closed and slated for demolition after a 1976 fire "well-nigh destroyed the interior," according to Christ the King's website. But in 2003, the community rallied to save it, and the archdiocese agreed to restore it — to the tune of $7.3 million. In 2004 it became an officially recognized landmark. Services have been held there since 2008, though the building's restoration was slow, with the church still in need of a new ceiling, and the roof being unfinished as of April 2014. The building is more than a church. 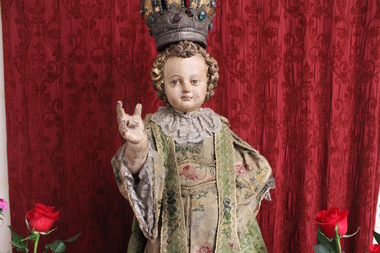 As a one of the city's rare shrines, the priests are tasked with maintaining the building as a place of Catholic pilgrimage and protecting the 300-year-old statue of Christ the Child, which was saved from the fire. Estimates to restore the building range from $3 million to $6 million, according to the coalition.